The operating times of the glacier lifts depend on weather, snow and operating conditions. Skiing operation until June 2, 2019. From June 29 until July 21, 2019 summer skiing operation, then open again from autumn 2019. 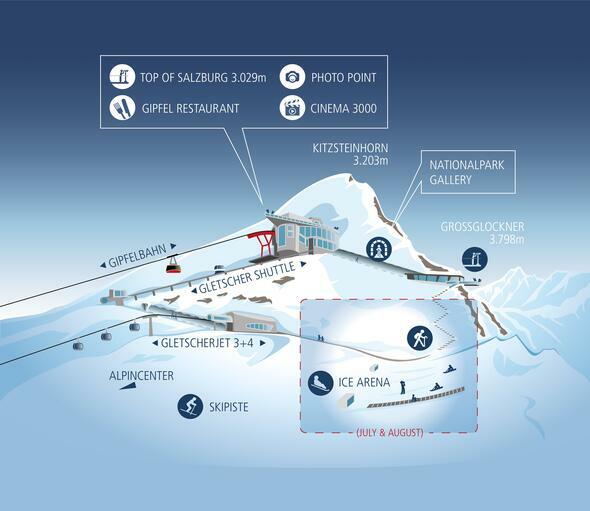 The lifts at the Kitzsteinhorn are in operation for excursion guests throughout the year. The ski pass includes one glacier uphill ride with the feeder lifts per day. Additional uphill rides only with advance reservation during the first uphill ride. Ski passes valid at the Kitzsteinhorn and the Maiskogel in Kaprun and on the Schmitten in Zell am See. Ski passes are valid for use from 3.00 p.m. on the previous day. *Children and youth prices available only upon presentation of valid ID. Children born in or after 2013 or younger are transported free of charge if accompanied by an adult. Keycard deposit EUR 2,-. Return of undamaged KeyCards at any of the ticket offices. All prices in euros include 10 % VAT. Subject to date and price changes. Tip: Every Saturday children* and youth* under the age of 19 pay only € 10,- for a day ski pass. The operating times of the glacier lifts are depending upon weather conditions, snow and operational demand. Skiing operation until June 2, 2019. From June 29 until July 21, 2019 summer skiing operation, then open again from autumn 2019. For non-skiing guests the cable ways are opened all year round. Children (photo) born in or after 2014 or younger are transported free of charge if accompanied by an adult. Day tickets valid at the Maiskogel and the Lechnerberg in Kaprun. *Children prices available only upon presentation of valid ID. All children and young people under the age of 19 pay only EURO 10.00 for a day ticket every Saturday from approx. December until April. Enjoy pure skiing pleasure on 200 days of skiing, on more than 2,700 piste kilometres, in Salzburg, parts of Tyrol, Styria, Carinthia, Upper Austria and Bavaria with 900 cable cars and lifts. Card already valid from mid-October! Family bonus: Free season tickets for all children/youth (born 2000 or younger), if a family purchases two season tickets for the elder children, resp. for youth. Tax authorities validation of the family allowance is required.